When Shasta discovers he is not Arsheesh’s son and therefore does not belong in the cruel land of Calormen, he joins forces with Bree the talking horse and flees north towards Narnia, where freedom reigns. And so begins their hazardous journey, fraught with mystery and danger. Calormen’s capital city of Tashbaan must be crossed, a harsh desert endured, the high mountains of Archenland climbed, their enemies overcome. For the young Shasta it is an adventure beyond his wildest dreams and one destined to change his life forever. There was a brief mention of The Horse and His Boy in The Silver Chair, and it was known as a tale told to kids during High King Peter’s time. The recommended order of reading the Narnia series sometimes switches this book with The Silver Chair, so as I was reading this I wondered if there would be a difference if I read this first before the other one, even if they were almost completely unrelated. I did miss the Pevensie siblings in the last book, so it was nice to be back in time for a bit to read about them as minor characters in the story. Shasta is a fisherman’s son, and he’s often treated cruelly by his father, Arsheesh. One night, he heard his father discussing with a visitor about selling Shasta. Resigned to accept his fate, he was surprised when the visitor’s horse started talking to him. It turns out that the horse, who Shasta named Bree, was a Narnian horse, and everyone knows that all animals in Narnia speak. Bree invites Shasta to escape and head to Narnia up North, and the boy agrees, even if he knew nothing of riding a horse (much less own his own pair of riding boots) or how they would get to Narnia. All he knows is that he doesn’t have anything left at Calormen, and he’s always been attracted by the North. So begins Bree and Shasta’s adventures, where they meet another escapee, get chased by lions, cross an enemy kingdom and treacherous deserts, and somewhere along the way, Shasta finds out something about himself that changes his life forever. Of all the Narnia books I have read so far, I had a hard time writing a review for this one. I’m not sure why, except that I can’t decide if I like the book or not. As with all the other Narnia books, The Horse and His Boy is classic fantasy: a character with an unknown heritage, talking creatures, a quest and villainous plan to get a queen and destroy a kingdom. It’s a good tale and it feels like this book could really be read even with little knowledge of what Narnia was about. I enjoyed reading this, except maybe I was looking for something similar to The Silver Chair. You know, that sense of adventure, of going on a quest for Aslan, and the fact that everyone who’s been to Narnia knows who Aslan was, so the excitement of him saving the day was anticipated. Being foreigners from Narnia, the characters in this book know Aslan as a legend, or as a spirit that comes in the form of a fearsome lion. Another thing is that I was so used to reading about Narnia ruled by Caspian the Tenth and not by the Pevensie siblings, so actually reading about Susan and Edmund being King and Queen and doing royalty stuff was a novelty. 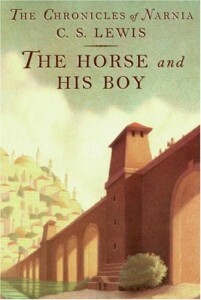 I guess what I want to say is The Horse and His Boy was a different kind of Narnia book. Don’t get me wrong — it’s good, but I guess I needed a little time to really get it and like it. I liked how everything turned out in the end. I also liked how C.S. Lewis stressed how there was a purpose with everything that happened to the characters, that Shasta’s adoption wasn’t a mistake and that even being chased by a lion in the desert had a reason behind it and it was all for their good. This book reminds me to keep on believing that despite the bad things that happen in our lives. There is a purpose, and we might not see it now, but it will eventually be revealed in the end. If The Silver Chair was a book that seemed to gear towards people who have been believers for a while and who need a reminder of the “instructions” from Aslan, I think The Horse and His Boy is written for those who are new in the faith, for them to find someone to relate to in the form of Shasta and his companions in discovering who Aslan is. The theology wasn’t as “blatant” (well that’s what other people call it) as the ones in the others book, which makes it perfect to share with people who are curious about Christianity and for people to re-read.